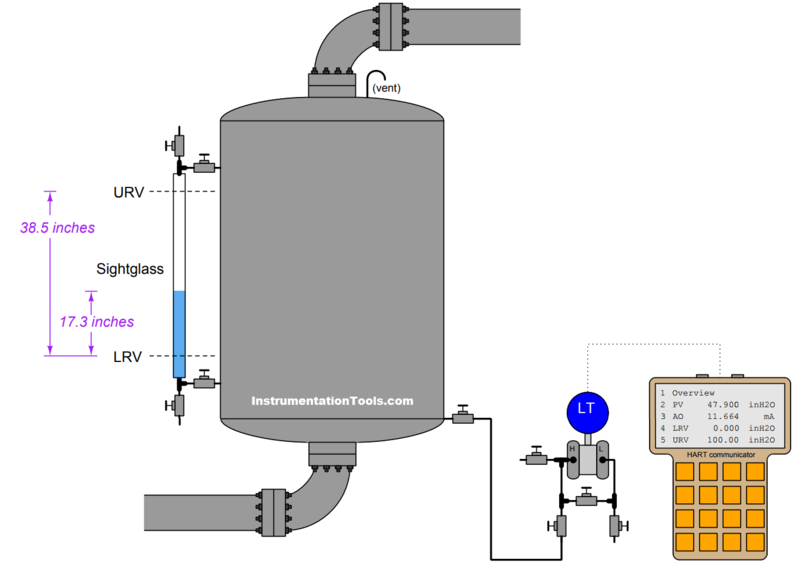 When installing a hydrostatic level transmitter on a working process, one must determine the proper lower- and upper-range values (LRV and URV) for the transmitter in order to properly register 0% at the LRV liquid level and 100% at the URV liquid level. If all fluid densities and physical dimensions are known in advance, this is a simple matter of a few mathematical calculations. However, sometimes it is difficult to know all the physical dimensions in advance, especially the elevation or suppression. This transmitter has already been calibrated at the instrument shop to accurately register applied pressure, but its range values have not been customized to the installation. Using a tape measure, we find a vertical distance of 38.5 inches between the LRV and URV points marked on the sightglass, and we also see the current liquid level is 17.3 inches above the marked LRV point. Using a HART communicator to interrogate this “smart” transmitter, we see that the registered pressure at this process condition is 47.9 inches of water column (”WC), which is greater than 17.3 inches registered by the sightglass due to the transmitter’s suppression (physical location beneath the LRV point, creating a hydrostatic pressure simply due to process water inside the impulse tube). This 30.6 inch suppression then becomes the transmitter’s lower-range value, so that it will output 4 mA (0% signal) when the process water level is at the LRV height and the only pressure sensed by the transmitter is the hydrostatic pressure produced by water inside the 30.6 vertical inches of impulse tube. How Overload Heaters used to Automatically Shut the Motor OFF ?